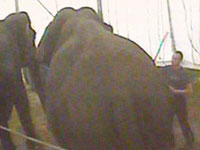 Having been released in a number of countries across Europe since Christmas, ‘The 100-year-old man who climbed out the window and disappeared’ is now heading to the UK and Ireland, where ADI exposed the terrible abuse inflicted on Vana Mana, the circus elephant who features in the movie, by her trainer and groom. Directed by Felix Herngren and released in the UK on July 4th, the film has already faced criticism by ADI and partner groups AnimaNaturalis (Spain), Code Animal (France), PETA (Germany) and Wilde Dieren de Tent Uit (The Netherlands). In Ireland we have joined forces with ARAN. Whilst performing at the Great British Circus, Vana Mana (also known as Wana Mana) and her companions Sonja and Delhi were beaten and chained for long periods. In Sweden last year, Cirkus Scott announced that it would stop using wild animals after the suffering of Vana Mana and Sonja – now known as Ghandi and Baby – was revealed. The elephants had been performing with the circus at the time. Although the Hundred-Year-Old Man bills itself as a comedy, there is absolutely nothing funny about the shocking abuse of Vana Mana. There is no need for animals to suffer in the name of entertainment – movie makers can use CGI instead. UPDATE In an article about the suffering of Vana Mana in the Huffington Post, the filmmakers state that "...we can confirm that the elephant was not mistreated or harmed in any way during the making of the film. At no stage during the filming process did the production have any reason to question the Cirkus Scott’s recommendation to use this particular elephant or the trainer." - as our investigations have time and again shown, the suffering of performing animals usually occurs in secret, off-set, and the only way to guarantee animals are not harmed for them not to be used.